Trying to find ingredients for old 'health food' quick bread pizza crust. ">Trying to find ingredients for old 'health food' quick bread pizza crust. How do I add pumpkin to my pancakes? ">How do I add pumpkin to my pancakes? I have a little bit (1/3 cup or so) of pumpkin puree left over in my fridge. I'd like to just stir it into my standard pancake recipe, but are there any guidelines for doing this? Do I have to adjust any of the other ingredients or ratios? I am urgently looking for a lost, much loved & used recipe from Jan. 1988 Bon appetite for pork loin with creamy mustard sauce. Anyone have it? ">I am urgently looking for a lost, much loved & used recipe from Jan. 1988 Bon appetite for pork loin with creamy mustard sauce. Anyone have it? 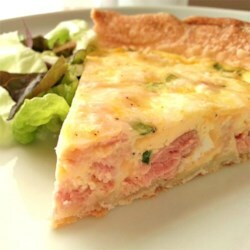 "Egg substitute, part-skim mozzarella, and fat-free evaporated milk are what make this delicious quiche waist-line friendly." 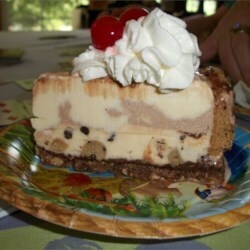 "Your favorite ice cream flavors in a cookie crust, topped with whipped cream, fudge and cherries."